Leaked emails reveal anti-Sanders CNN OP-Eds reviewed and rewritten by DNC and Clinton campaign. The recent trove of Democratic National Committee emails leaked by Guccifer 2.0 via Wikileaks continues to yield gold like Smaug's horde. One thread of emails shows a CNN staffer soliciting edits from both the DNC and the Clinton campaign prior to turning her work in to her editors. 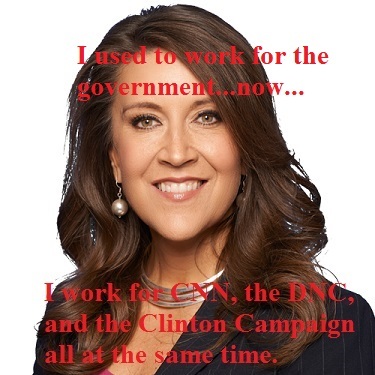 Maria Cardona's work background shows she receives two paychecks, one from CNN and the other from an inside the beltway PR firm. Yet she takes her marching orders from Luis Miranda, the Communications Director of the Democratic National Committee. After a confused and contentious Nevada Democratic Convention in which an applause meter, rather than voter or delegate intent, was used to anoint Clinton there were recriminations launched throughout the press against Sanders reporters. Cardona sounded off in an CNN Op-Ed against the Sanders campaign. The work flow from the email chain is clear. First a reporter who now works exclusively with CNN and CNN Espanol submits an article to the DNC. The DNC vets the article and then refers it to the Clinton campaign. After approval there the DNC checks it again. It is then submitted to the actual editorial staff of CNN for approval and publication. This work flow mirrors Cardona's career. Although she works at CNN as a political commentator, she also works at the Dewey Square Group (DSG), a PR firm. Prior to working at CNN exclusively, she also appeared regularly on Fox, MSNBC, Univision and Telemundo. She was a Senior Press Advisor to Clinton in 2008 and worked for as a key surrogate for the Obama campaign in 2008 and 2012. Vetting stories with Louis Miranda is not a strange thing for Cardona to do. She held his job from 2001 to 2003. Prior to that she worked in the previous Clinton Administration whitewashing immigration raids as Press Secretary for the INS. As Deputy Press Secretary and then lead Press Secretary in Clinton's Department of Commerce, she help secure the passage of NAFTA, which lead to economic devastation for both the American and Mexican working class. It is one thing to accuse the so-called unbiased media of being in bed with this or that institution. Cardona's career and actions demonstrate a social relationship much more intitmate than pillow talk between secret lovers. She perfectly illustrates that institutions in Washington DC, be they private or public, media or government, all share the same human resources department. The revolving door between the White House, the campaign headquarters, K Street lobbying firms, the news desk and the editorial room could not spin more clearly than in this case. At both the atomic level of individual events and the decades long institutional level, Washington DC and the Democratic party have aligned themselves against Democracy, The People and most of all the truth. Cardona manages to collect multiple six digit paychecks doing it.